Bright, south-facing 2,400SF split BR plan w/2 en suite BRs/2.5BA. Neutral palette, great bldg location. On the architectural curve with a huge terrace that provides more than 1,500SF outdoor space w/fantastic urban views. Step out onto terrace from living areas & 2nd BR. Wonderful for entertaining, every room has a terrace view. Warm Brazilian cherry hardwood floors. Open LR/DR w/TV & gas FP. Newer carpet in BRs. Well-planned chef’s delight kitchen w/Wolf, Sub-Zero appliances, Asko dishwasher, double ovens, beautiful granite counters, custom cabinets w/lots of storage and breakfast bar. Cozy den. Master suite w/deluxe spa bath, 2 large custom closets, jetted tub, huge shower, WC, heated floors. Office niche. 5 TVs, Surround Sound, Gas Grill, Washer & Dryer. 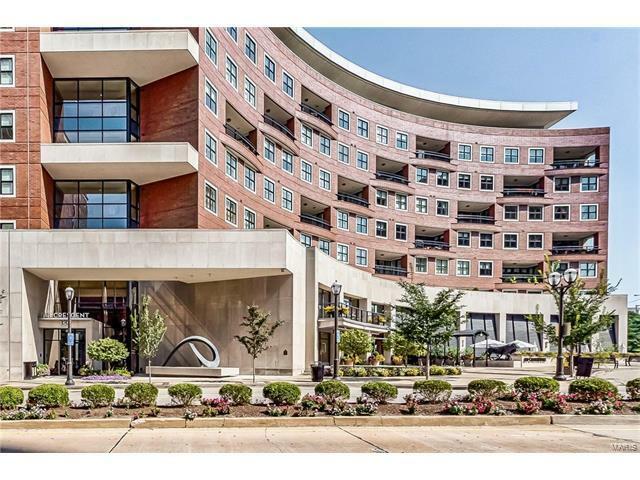 Bldg amenities: 24-hr front desk attendant, valet, on-site mgr, concierge, club/media rm w/kitchen, fitness ctr, garden w/dog park, secure/heated garage w/2 spaces, storage locker, bicycle storage. Hanley Road to east on Carondelet Plaza. Complimentary valet parking.